Get in the mood for Halloween with this fun quilt. A single Scrappy Jack block is free-pieced following careful guidelines given in the book. Other blocks are very, very basic with a little scrappy flair. Participants will have fun improvising and will get a really good start on (or perhaps even finish) a lap-sized quilt in an afternoon. No two quilts from the class will be the same! It’s also a great class for a group to share and exchange scraps and fabrics, making everyone’s projects all the more interesting. This class is perfect for confident beginners not afraid to improvise a little! An afternoon of 3–4 hours should give everyone a chance to get a quilt top started or perhaps even done. 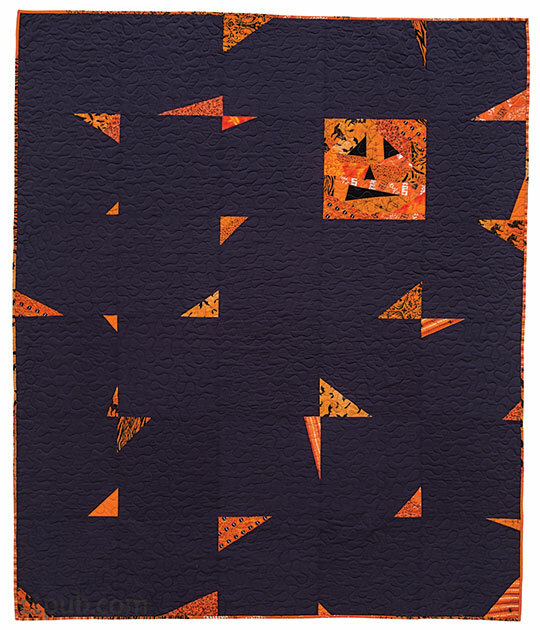 Note for shops: The Scrappy Jack Bits and Pieces Quilt uses a variety of scraps of orange and Halloween fabrics. Not all who want to participate will have a supply on hand, so it is a fun chance for everyone to share supplies. If each participant brought (or bought from you) several (4 to 8) fat quarters and shared, everyone would end up with a nice variety. You could also make up “scrap packs” ahead of time for participants to buy, bundling a variety of orange/Halloween fat-eighths and fat quarters. A design wall area might help participants who complete all their blocks and want to sew them together. But not all participants will get to this stage in the time allotted. Follow the instructions to make both the Scrappy Jack basic block and the Scrappy Jack Bits and Pieces Quilt in Sew a Modern Halloween by Riel Nason. Make the Scrappy Jack Block. Make the other quilt blocks with the scrappy edges. Make the Scrappy Jack Bits and Pieces Quilt.